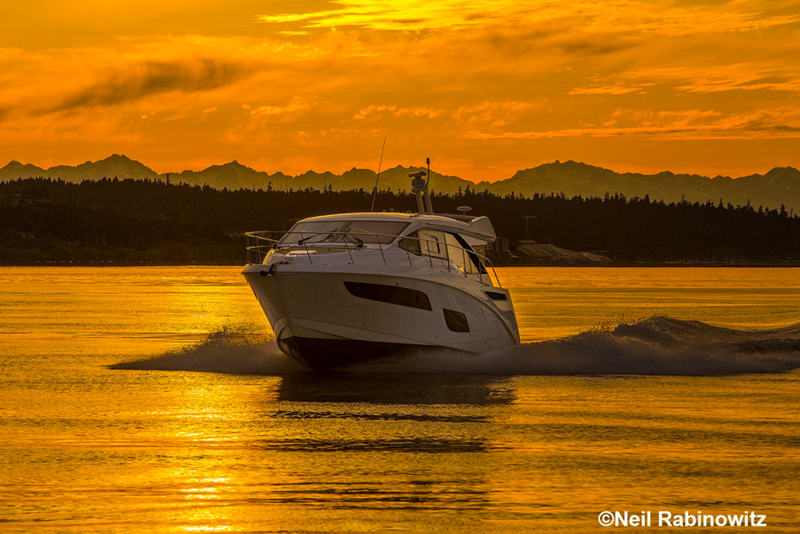 Sea Ray’s 2017 SLX 400 is a paradigm bursting with innovation and new ideas. When the new Sea Ray SLX 400 debuted at the 2017 Miami International Boat Show, I was onboard with boats.com Outboard Expert Charles Plueddeman. His thoughts? “This boat is about the floating as much as it is about the boating.” And I agreed—let’s see if you will, too. 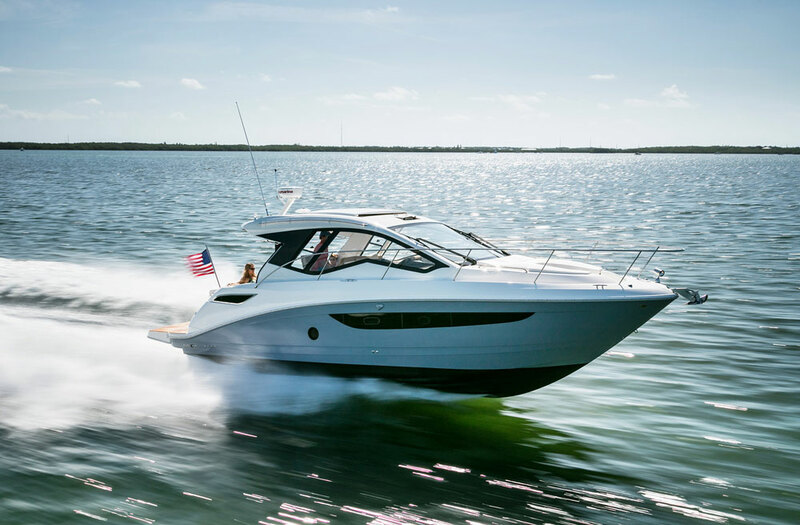 In the SLX 400, Sea Ray has done a masterful job of building a day boat that serves as much as a vehicle that can take you places as a platform for entertaining guests on the water. Like any boat, it must serve a number of purposes to be well received in the market, and the SLX 400 delivers on all fronts. It’s part deckboat, part cruiser, part midcabin runabout and certainly, part yacht. The deckboat function makes the SLX 400 a party platform, but it’s so much larger than any deckboat that it’s almost an unfair analogy. The spacious deck is the place to be, and Sea Ray even considered that when locating the galley. Two grills are up on deck—rather than in the midcabin—so the cook can socialize with his guests. The galley includes a sink,a refrigerator for food, and another for wine. Its location makes for easy cleanup, and it means you won’t have to sleep in a cabin that smells like the last thing you cooked. There’s an abundance of deck space and more seating than I can remember seeing on anything in this size range. What’s more, the entire cockpit, is covered by a hardtop, and the retractable fabric sunshade that extends to the aft bench. The hardtop has a sliding sunroof, too. As contradictory as it sounds, the sweet setup allows for an open sunroof and an extended sunshade—even your tall guests can enjoy it thanks to ample headroom. 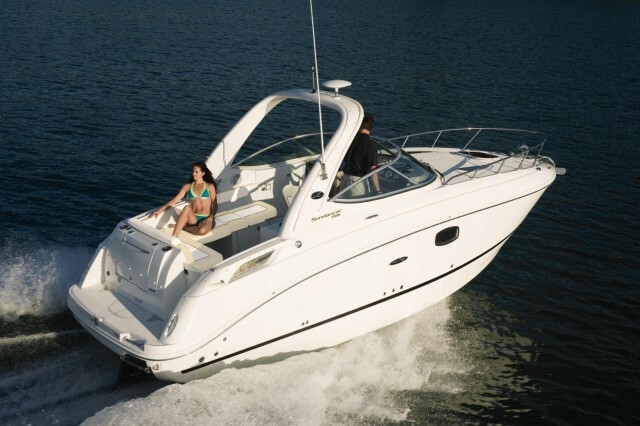 With an array of seating options available in the bow and in the cockpit, the SLX 400 also includes a hardtop, retractable sunshade and sunroof. 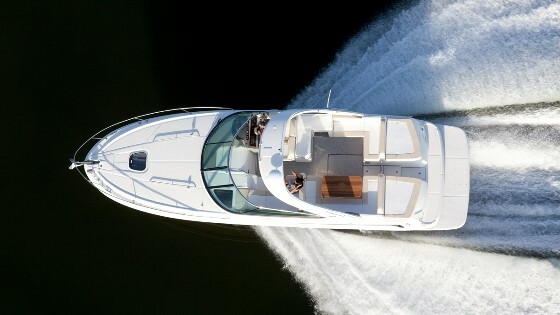 When it comes to seating, Sea Ray has hit its mark. 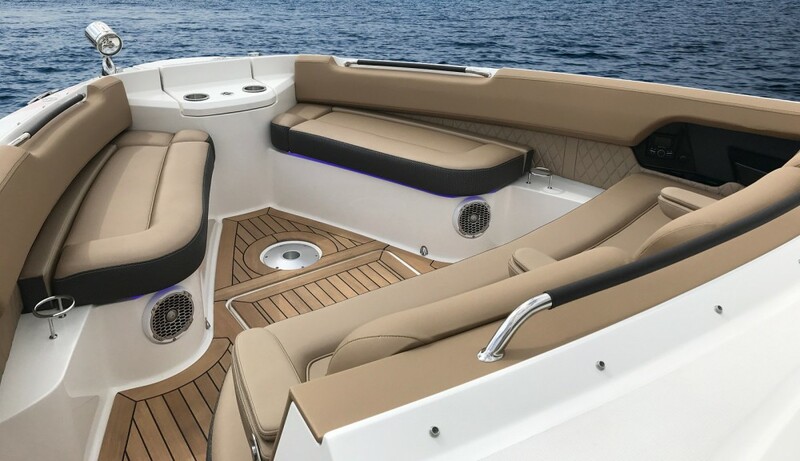 First, the double-wide passenger seat adjacent to the helm rotates on a pedestal so it becomes part of the “conversation pit” when the boat is anchored. Similarly, half of the aft bench backrest pivots to face the starboard side, and has enough stowage underneath to hold two stand-up paddleboards. The aft lounge opens to what is probably the most striking feature of the SLX 400: the fold-down swim terrace. The aft end of the starboard gunwale powers down electrically to create another swim platform and greater access to the water. The cruiser and yacht aspects of the SLX 400 include the overnighting capability, luxurious materials and fastidious attention detail. 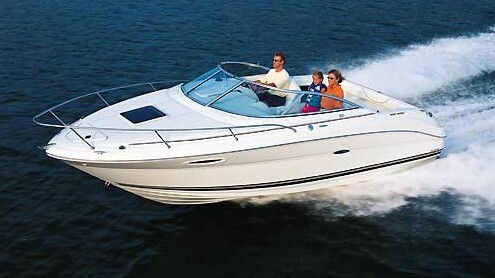 For example, the helm is all glass with twin 12-inch Raymarine glass displays. The boat also comes with Axius joystick controls to make docking easier, and it does it without a bow thruster. In the bow, the SLX 400 makes room for at least five people thanks to a triple wide forward-facing seat and two forward benches. 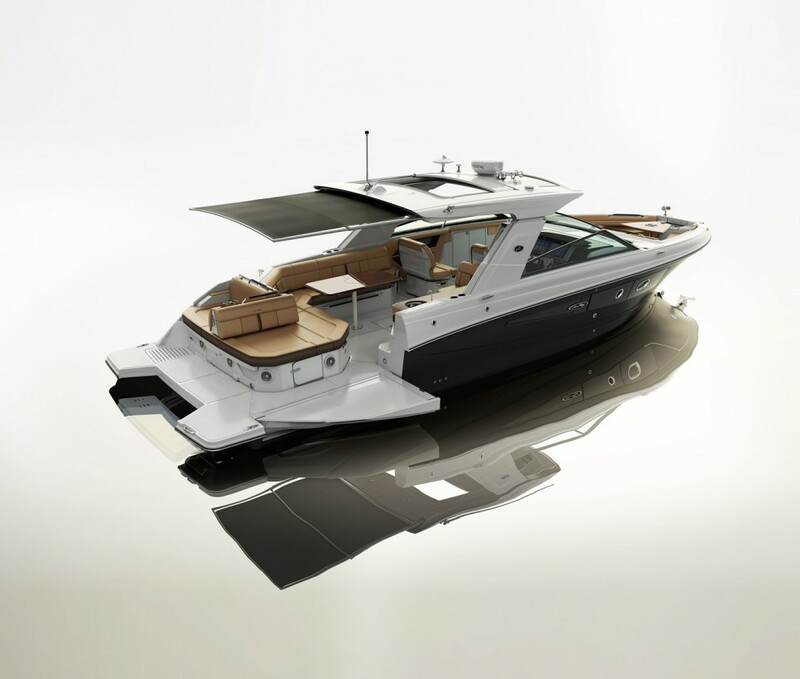 In the bow, the SLX 400 shows its midcabin runabout side, with a triple wide forward-facing seat with fold-down armrests, additional forward benches and a removable dinette table that also converts to a sunpad. Belowdecks, the cabin features a V-berth and an aft cabin large enough for four people to spend the night aboard, another table for dining and a full head compartment. You have to step on board the SLX 400 to appreciate the amount of thought and effort Sea Ray designers and engineers have put into this boat. It presents some of the most innovative ideas we’ve seen in a long time, and it really is a new paradigm of what a boat can be. 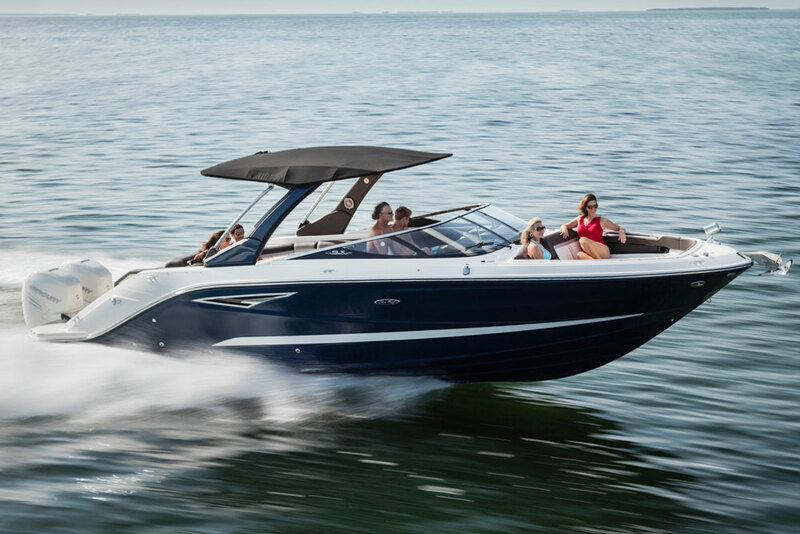 Other Choices: It’s easy to see that the SLX 400 is one unique boat. 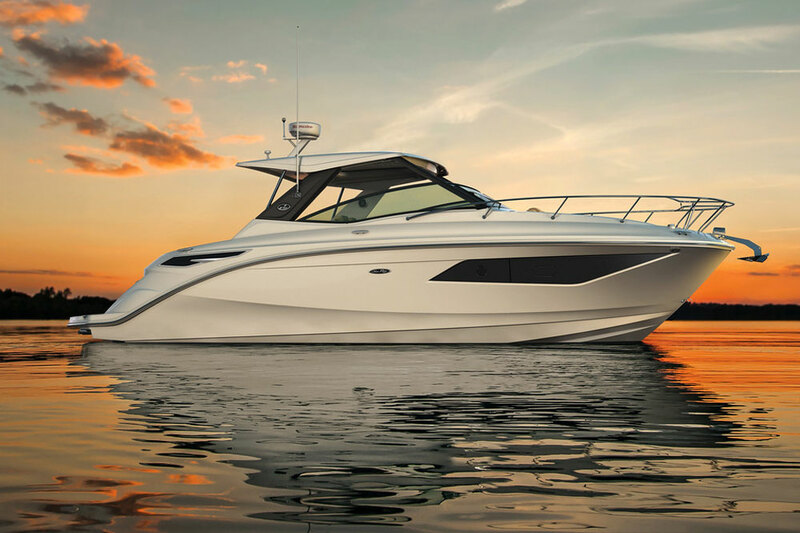 To match it’s distinctive style and massive size, you may want to check out the Four Winns Horizon H440 that offers more cabin space, or the sportier Formula 430 SSC. 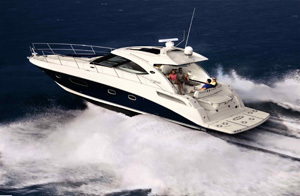 See Sea Ray SLX 400 listings.